Here’s the story of TransOrg Analytics, a Predictive Analytics and Big Data company that helps clients in driving their customer acquisition, engagement and retention initiatives profitably. Tell us about the story of Transorg – Why/how/when did you start this? What led to the creation of TransOrg Analytics? Firstly it was my desire to become an entrepreneur (with a history of a failed enterprise) and secondly limited opportunities to grow at senior levels in India, more so if you are working with a multinational. It did not take me long to zero in on predictive analytics venture, as I saw the huge potential while working with a Global Financial Services organization. My willingness to take risks and never ending need to work in diverse roles was the foundation of becoming an entrepreneur in 2009. In the early days of TransOrg, my diverse skill set was of great help – right from managing funds, writing legal agreements, maintaining books, developing business, delivering on the projects and most crucial of all cleaning the office every morning! What is your aspiration for the venture? Big Data and Analytics is the science of uncovering deeper, hidden relationships from within data to make more effective decisions. It is at a nascent stage in India and will witness a tremendous growth in the near future. Both on-shore and off-shore analytics services have huge potential. India is well position to supply the analytics talent, as increasingly there is a shortfall in number of data scientists required to meet industry needs. Predictive analytics and real time understanding of consumer behavior will support business leaders in taking well informed decisions which along with their business knowledge and intuition will drive actions which are bang-on the target. In the absence of market leader positions and given that analytics as a concept is till gaining acceptance in the market, there is a strong opportunity to build a profitable big data and analytics business. TransOrg is working with corporate clients to build awareness about analytics and how it can be used to out-perform competition and drive profitable growth. TransOrg’s goal is to establish itself as a top player in the predictive analytics and big data field, and offer forward looking and cost effective solutions to both Indian and global organizations. What challenges did you face and how did you deal with them? 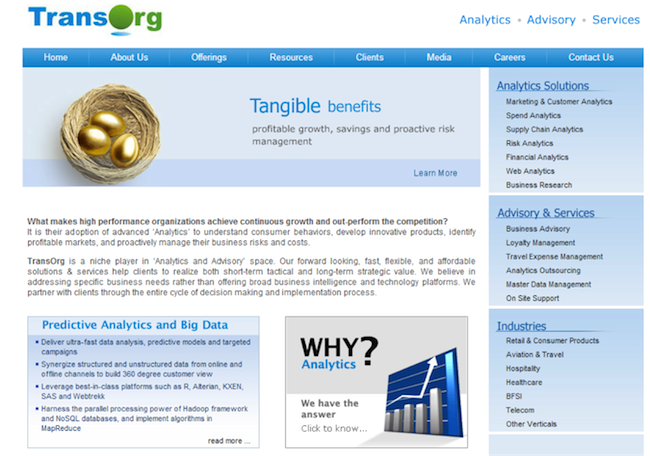 TransOrg’s initial days were focused on creating offerings and solution briefs. We were lucky to build an informal team of friends who were very helpful in sharing their inputs on analytics. We spent hours in brainstorming to come up with sales pitches. Initially we thought of focusing on Indian clients. It was difficult to sell analytics in India as a number of CXOs knew vaguely about analytics. TransOrg thought of doing ‘proof of concepts’ with Indian companies to educate them on analytics and convince them about the power of analytics and, their capabilities and service levels. We started to focus on retail, BFSI, consumer goods, telecom, hospitality and travel sectors. After working on our offerings we started to pitch to prospective clients. The first breakthrough happened again by a sheer coincidence. We met CEO of this company at a friend’s party and he liked the idea of implementing targeted marketing and campaign management for his organization. We presented to their team and landed with first 4-6 week ‘proof of concept’. This proof of concept helped the client in building strong need of analytics for his organization and at the same time it gave TransOrg number of ideas to improve their offerings. Converting ‘proof of concepts’ into full term engagements, was quite an experience. We had to go to multiple meetings at various levels to convince them about benefits and ROIs. We had to convince them about data protection. Confidentiality agreements and contract terms took them longer than expected. Clearly B2B business cycle is longer one, more than six months. We held our ground, kept on following up the clients and finally we were successful in getting the money paying long period engagements. What did you learn from the journey so far? Most of the organizations have faced recession and lot has been covered by media about it but TransOrg had a unique experience. We launched our enterprise in the middle of the worst recession. Why would one think of an enterprise in such bad business conditions? In fact it was an ideal time to start. We spent our initial months on developing offers and conducting market assessment. In this period we did not focus on business development – we would not have got much business anyways. Other established players were not getting any business because of recession. So we did not lose much. Rather we got access to talented people during the recession which was important for us to build the business model. When we got ready with their offering, markets started to improve and we were successful in getting the initial projects. Timing could not have been better! If you had to start all over again, what would you do differently? Invest in creating a brand and a strong business development team – right from the word go! Next Next post: Is it considered a pivot when a startup changes it’s customer segments?